This Presentation date is January 18, 2017 at 13:00 - 15:00 local time. 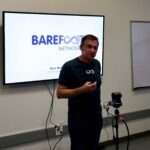 Martin Izzard, Co-Founder and CEO of Barefoot Networks, introduces the company. He goes through his origin story, as well as the pedigree of the co-founders in the networking industry. Finally he gives an overview of what Barefoot Networks is trying to do: bring programmability to the data-plane. Nick McKeown, Co-Founder and Chief Scientist at Barefoot Networks, reviews the current state of network switches. The slow development time and functions fixed in silicon show why a programmable switch is appealing. Barefoot Networks sees this as the next evolution of domain specific processors, in the same vein as Java and OpenCL. Barefoot’s take on this is Tofino, a P4 programmable network switch. Dan Lenoski, Co-Founder and VP of Engineering at Barefoot Networks, goes into a deeper technical review of the Tofino Switch. On top of programmability, it’s also the fastest, able to to 6.5 Tbps. This allows for up to 65 100GE ports on the device. He then goes over some of the capabilities of the compiler, and the debugging tools available. Ed Doe, VP of Product Strategy at Barefoot Networks, reviews how Tofino switches can be integrated. The P4 programmability can either be done with direct updates from the OEMs, or handled in house if you’re using a white box configuration. 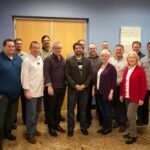 Initial OEM partners include Edgecore Networks and WNC, with more planned throughout 2017. Roberto Mari, Director of Product Management at Barefoot Networks, demonstrates how to program with P4 on Tofino switches. He reviews use cases that P4 can address, including preventing network congestion, load balancing, and getting in-band telemetry. Roberto Mari, Director of Product Management at Barefoot Networks, demonstrates programming Tofino. He shows the UI that can allow for some configuration. Further, he shows how to compile and push the update to the switch itself. Chang Kim, Director of System Architecture at Barefoot Networks, reviews some of the network monitoring, visibility and diagnostic capabilities of Barefoot’s programmable switch. He reviews conceptually how this is accomplished, where current products fall short, and demonstrates this in practice.